On offer is a set of front brake pads suitable for the; Opel Manta A, Opel Kadett C, Vauxhall Chevette and many other GM vehicles, some of which use them for the rear brakes. The Opel catalogue number is 1 171 1051 and the part number is 2797962. These are genuine OEM quality AC Delco parts; unlike the modern equivalent, these pads have a softer compound which provides great stopping power and doesn't wear your brake discs out so rapidly. After many miles of testing, I can confirm that their average lifespan will be around 25,000 miles for a manual transmission car, when used for regular suburban driving. The asking price is just £15 the price includes delivery within the UK. I can send to some European locations too, but please ask for a quote first as this could be quite a high sum. They have also been used by other manufacturers too, the full list can be found here & here. The Opel catalogue number is 1 171 1051 and the part number is 2797962. 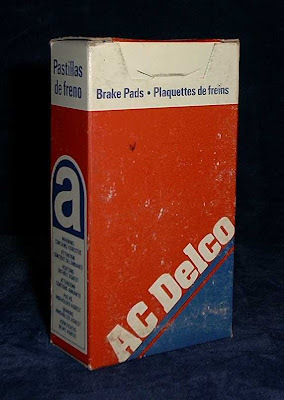 These are genuine OEM quality AC Delco parts; unlike the modern equivalents these pads have a softer compound, which provides great stopping power and dosen't wear your brake discs out so rapidly. After many miles of testing, I can confirm that their average lifespan will be around 25,000 miles for a manual transmission car, when used for regular cross country driving.